Berlioz - List of works. Best Classical Tunes. Hector Berlioz is the only truly great French Romantic composer, and he is regarded as a pioneer of modern orchestration. His music was often ignored and derided in France during his lifetime, and has come to be fully appreciated there only towards the end of the 19th century. He was born the son of a country doctor, who encouraged his studies in literature, but not in music. He studied at the Paris Conservatoire in his mid twenties, and at the age of 27 he won the Prix de Rome. He was a friend of Liszt and Wagner. His music is intense and very theatrical, as he was a great enthusiast of literature and the stage. He fell in love with an English Actress, Harriet Smithson. The recurring theme of the Symphonie Fantastique is called the id�e fixe, and it represents her in Berlioz's imagination. Berlioz's overtures are not in Sonata form, as was usual in the Classical era, but are symphonic tone poems, strongly influenced by romantic literature, including Shakespeare. Examples are King Lear and Rob Roy, and his most famous is Roman Carnival. His symphonies are effectively a series of musical scenes or tableaux, and a long distance from the formal structures of classical Mozart. These include the dramatic symphonies Romeo and Juliet, The Damnation of Faust, and his masterwork - the Symphonie Fantastique. 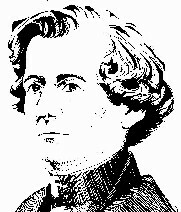 Berlioz was also a famous writer and critic. He wrote a standard work on orchestration, entitled Trait� d'instrumentation et d'orchestration modernes. He regularly used large numbers of instruments in his own compositions, and was a master of contrast. Works written by Berlioz Audio is available for 13 tunes by this composer.